I finally got around to installing a turn signal beeper on Wife's motorcycle. Rather than a simple beeper that's on whenever the signal is on. I did one that's on only when the signal is on...and the brakes are off. With brakes on, the buzzer shuts up. Much easier than I expected. The trick is to ground the buzzer through the positive wire of the brake light. When the brakes are off, there is a path to ground through the bulb--you don't get full voltage, but plenty to run the buzzer whenever the turn signal is on. When the brakes are on, you get 12 volts on both sides of the buzzer...so no sound. An additional benefit is that a blown out brake light bulb will keep the buzzer from working, and a bad brake light switch (a problem Wife's Savage had when we got it) means that the buzzer will be on even with the brakes applied. Sous Vide is a method of cooking food in a vacuum sealed plastic bag (Sous Vide means "under vacuum" in french, although vacuum is a minor part of the process) in a precisely controlled hot water bath, generally for a longer than normal time but at a lower than normal temperature--usually at the final temperature of the food. It was invented in the late 60's. I first heard about it in a restaurant trade magazine in the late 80's. Until recently the equipment needed would cost several thousand dollars, but prices have come down drastically. Last year I ran across a couple of articles on sous vide machines at the high end of consumer prices. A few months ago saw an article on a Kickstarter project for Sansaire, Sous Vide for $200. That sparked my interest, and I almost pre-ordered before doing more research. To cook this medium rare London Broil, I set the temperature to 135 degrees F. I sealed the meat in a Foodsaver bag and put the bagged meat in the bath for several hours. Just before serving heat a frying pan or griddle to high heat with a little oil, then dry the meat and sear for 30 seconds or so per side--just enough to brown the outside layer, not long enough to further cook the inside. Serve immediately. An added bonus is that the meat doesn't lose its juices on your plate--this means my wife can eat medium rare meat without being turned off by the bloody juices. According to many sources the most expensive cuts of beef are prized for tenderness, despite having less flavor than cheaper cuts. For Country-Style pork ribs, 145 for 32 hours resulted in a moist rib that could be cut even across the grain with a fork. You can put meat in directly from the freezer, and it thaws quickly, passing through the spoilage "danger zone" for a fraction of the recommended maximum time. If the meal is delayed, the meat can stay in the hot bath until serving time without burning or over-cooking. There are some oddities--You apparently can't use raw garlic with most meat, because the garlic needs a much higher temperature to cook. It is difficult to cook vegetables and meat in the same bath, since vegetables require much hotter temperatures. 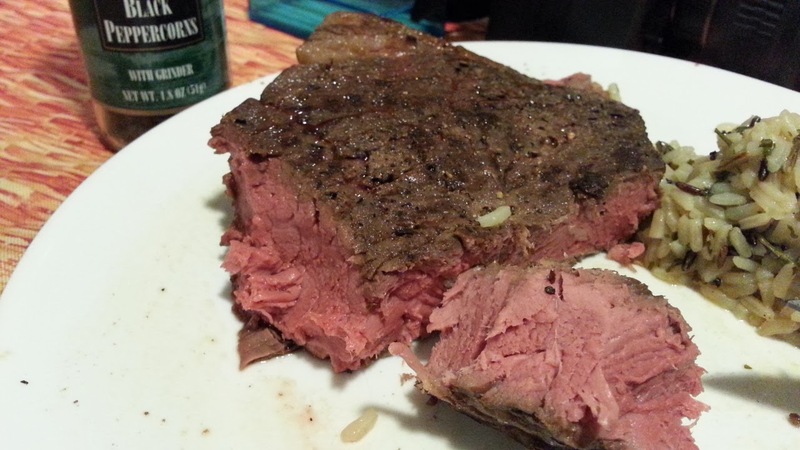 Without a sear, meat appears as if boiled or poached. Meat needs to be served immediately after removing from the bath and searing, since there isn't a layer of overheated meat to keep it warm. For most foods that require long cook times, you can pre-cook, then refrigerate or freeze in the bag and re-heat in the bath just long enough to heat through. Currently home Sous-Vide setups can be divided into 3 broad categories--All in one, Circulator, and controllers. All in One units (Sous Vide Supreme) are generally the most expensive and include the container for the water--but generally rely only on convection to circulate the water. They are also quite large. Controllers (Dorkfood) are the least expensive, but require your own appliance-a rice cooker, manual crock pot or coffee urn for example. These also rely on convection. If you already have an appropriate appliance, these take the least storage space. Circulators generally clamp to a container you provide, which can be a large pot, bucket, plastic bin or cooler. They are generally less expensive and take up less storage space. 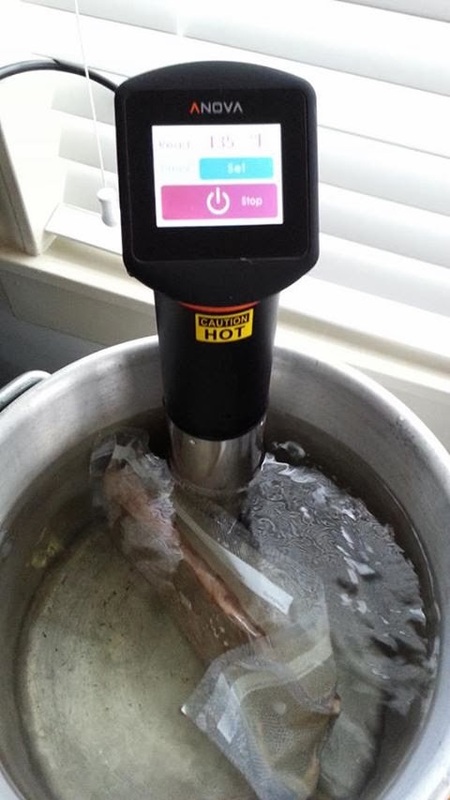 Most of the latest generation of moderate cost Sous Vide machines are circulators--Anova, Polyscience, Sansaire, Nomiku, and SideKIC. Most of these are very similar in design--they are fairly tall an narrow, clamp to your container with the heater and impeller submerged. The PolyScience circulators are made by a lab equipment company, and appear to be well made and versatile--but they are at least twice as expensive as the Anova or Sansaire. Nomiku is a kickstarter project, and appears to be a well made unit at around $300. The SideKIC uses the same principles, with a different implementation. It is the cheapest by a relatively small amount, but also the most limited in design. Based on reviews its heater is weak--it maintains temperature well, but takes a long time to raise the temperature. It has a narrow range of acceptable water levels, is often out of stock and has reliability problems. established US lab circulator company. Meanwhile the Sansaire is being contract manufactured in China for a start-up company and has yet to ship retail (reviews have all been on pre-production samples). With Anova dropping their price to $200 (plus $20 shipping) to match the Sansaire, the decision was easy, and I bought the Anova. So far I've used it in a large stock pot covered in aluminum foil. I just bought a cooler, cut a hole in the lid for the circulator and I've got chicken breasts in it right now. Update-Chicken breasts cooked at 147 degrees for 4 hours were slightly more tender than I'd prefer. Next time I'll probably try 150 for 2 hours.